Notes: Harbres Research is a research firm trying to make the leap from theoretical and laboratory work to practical space exploration. Having lined up the backing of financier and ESPN World Series of Poker champion Mark, the team utilizes a community of leaders to determine their direction, represented by globe-trotting volleyball/tennis multi-athlete Matt and the lesser known but no less effective Dr. Andres, inventor of the left-handed Kerbalshifter and the nuclear engine. Due to their many commitments, team members must also maintain their regular theoretical workload, limiting the group to launches on Mondays, Wednesdays, and Fridays only unless all three directors are present. 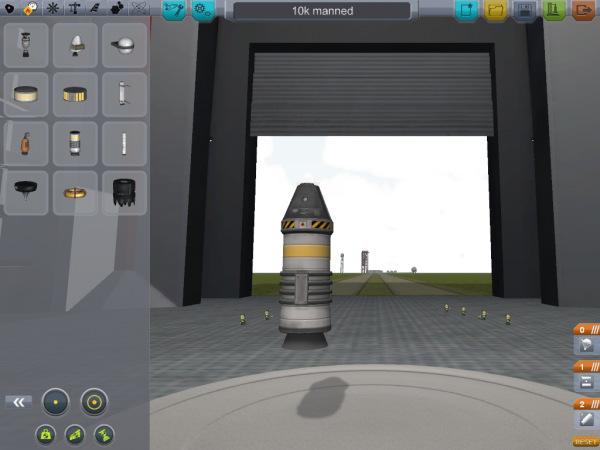 Launch Goal: To understand how fuel, decouplers, stages and parachutes work to get teh Kerbal safely up and down. yo dawg. go ahead. looks legit! Play-by-Play: When the rocket fire, poor Bill Kerman was thrust upward experiences Gee forces of 2G. Riding on a tail of fire, Bill flew into the sky until all people could see from the ground was a faint light until sudenly it went out. "Oh no is this the end of Bill?" No just the fuel has been spend and now stage two has been activated. The decoupler does it's job and the spent fuel tank falls away from the cockpit and Bill countinues up. At a height of 18300m gravity finally grabs ahold of Bill's ship and he starts to fall back to the planet. At 10,000m the parachute is partial released and Bills free fall begins to slow until at 500m it fully opens slow Bill to the safe speed of 6.2m/s. 4minutes 13 seconds after launch BIll lands safely on the planet the first Kerban to reach a height of over 10,000 meters above the surface. Opportunities / Learnings: We learn how to stage different events, use decouplers, and parachutes. Nice job! Award of $20K to Harbres Research for the first successful manned launch to 10 km and $5K to Charlie's team for another safety rep success! Pilot Plan: First all three main rockets will fire lift the rocket off the ground. Once the fuel has been spent, the two side fuel tanks will detach and fall back to earth with parachutes so that they can be recovered. Then the middle engine will continue to fire getting the rocket high enought to maintain an orbit before detaching and falling back to earth to be recovered. The final engine will be used to get the satelite on the right course to stay in orbit. Hey, I like the design. Hope that the parachutes work well enough to salvage your fuel tanks and such. I'm giving this design the "thumbs-up". You're all clear to launch!!! How do you know you have enough fuel to get into orbit efficiently? Team Members Present: Just Me Matt Herbrand. Play-by-Play: At 1:43 the three rockets all fired lifting the first telecommunication satillite off into the sky. 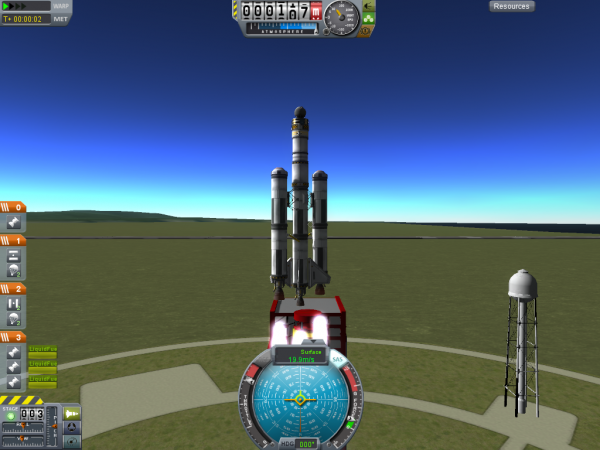 All seems to be going well until almost two minutes after launch the two external fuel cans fell off the side. At the same time two parachutes open on those tanks allowing for the tanks to be recovered. 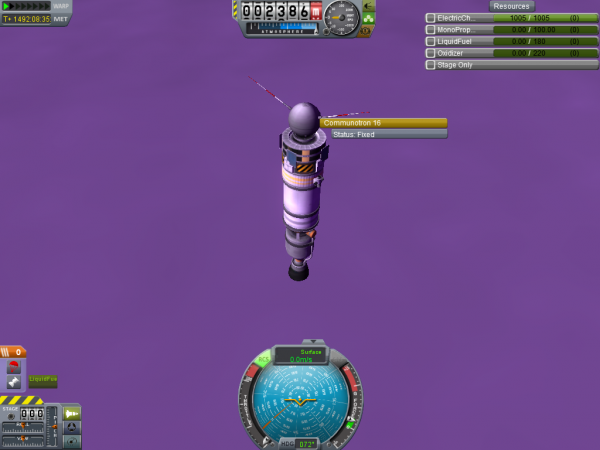 The middle rocket continues to fire until three minutes later it detaches and fall back to Kerbal with parachutes for recovery. 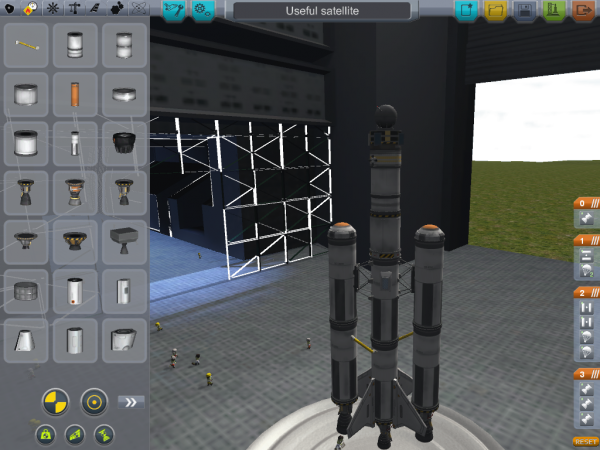 Now the finally rocket burns for just a few seconds and it puts the satellite into a stable orbit above Kerbal thus allowing the Kerbals on the ground to make calls from just about anywhere using their new satellite. Milestone awarded: 1st working satellite in orbit, $80K. Things to think about -- how efficient are you at getting into orbit? Could it be accomplished with less fuel? As you design your missions, how can you plan to make sure you have enough fuel at the required times in order to be successful, with a bit of extra as a safety net, without wasting lots of fuel and money? Great job at getting into orbit! I believe the rocket could be more efficient bur good for your first try. My first orbital rocket was a over-kill. 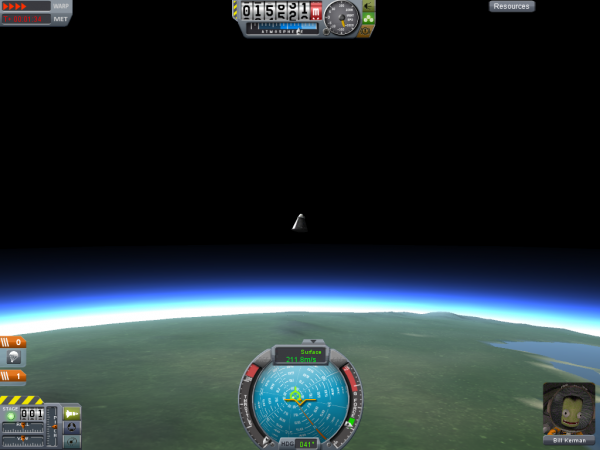 For your first attempt at putting a satellite into orbit this is actually quite impressive. As for matters of efficiency, before I could see the pics I seen in your parts log that you were bringing a lot of fuel and you would no question be able to achieve your goal even if you halved your final stage. You did however do a fair job with what you used. Nice use of fuel lines to feed the central tank. Lastly remember terminal velocity. Overthrottling too early can cost you a lot of fuel for not a lot of gain. Just a reminder to team Harbres that no launches will be credited milestone awards in the future on Tuesdays or Thursdays unless all three directors are present as a condition of the team's incorporation. Credit may still be awarded for in-space maneuvers as well as research awards, writing awards, etc., but launches themselves can only be conducted on days not beginning with "T" unless the entire team is present. That looks good. Also, Looks l3g1t d4wg, go 4h34d. How can you be sure that you will reach Mun orbit? 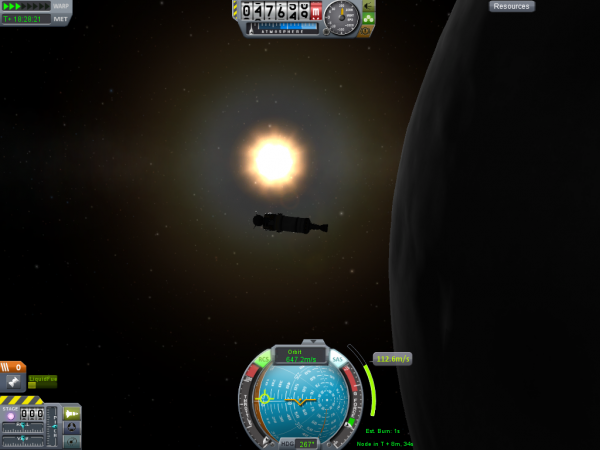 Are you going to circularize your Kerbin orbit first or burn straight for Mun? What Time would the most reasonable launch window be to meet your goals? 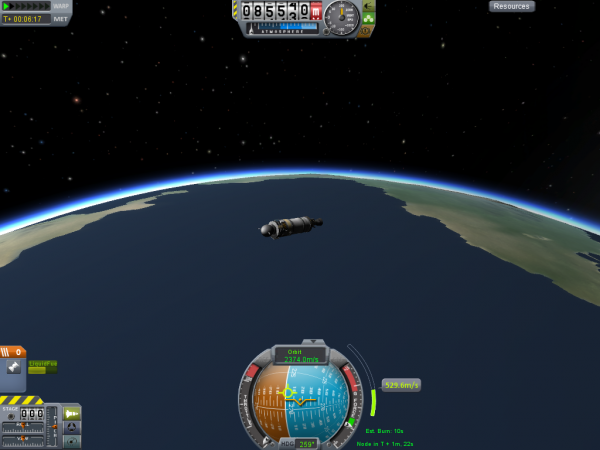 Play-by-Play: Launched off of surface of Kerbal and began orbiting the planet. 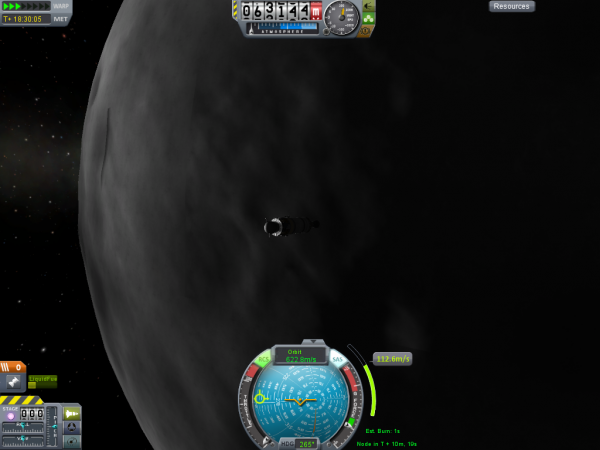 Then, extended orbit out to a point of intersection with Mun's orbit, where we began to orbit around Mun. 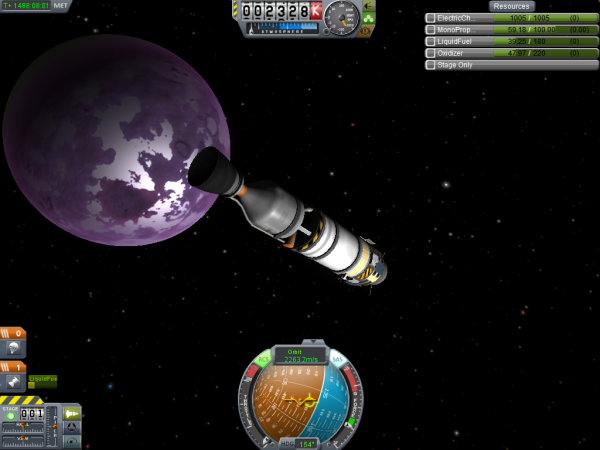 Summary: We were able to break orbit with Kerbal and then regain orbit with the Mun with an unmanned space satellite. Strategies / Project Timeline:After learning how to take orbits from close planets and use it to create an orbit with a different planet, we now plan to orbit a new planet using this same strategy. Design Goals: This vehicle is designed to take the satellite to another planet put it in orbit for a while and then land it on the planet to study it's the conditions on the planet. 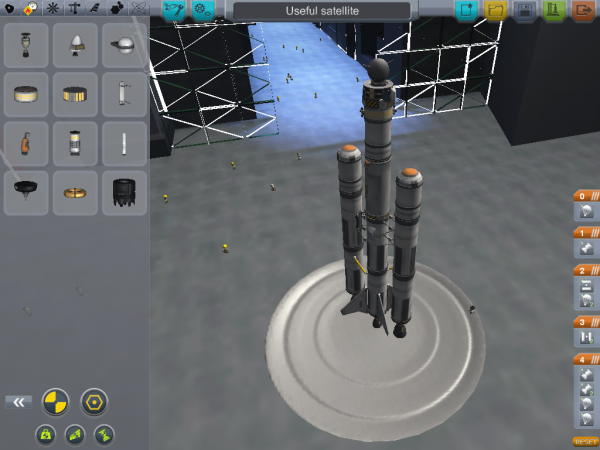 This will require more fuel than the fuel to get to the mun but we are confident that we'll have enough because the Mun satellite has plently of fuel left and as shown to us by the expedition to Mimmus with Brazanah Inc. it doesn't take that much fuel to move in space. But just in case we are adding a nuclear engine so we are fuel effiecient. Launch Goal: On this launch we are hoping to learn how to get into orbit around a different planet than Kerban. This is new because we'll have to escape Kerban which we've never done before. Pilot Plan: Fire all 3 rockets upon launch until external fuel tanks empty, then decouple the external fuel tanks, and continue to fire using the central rocket until we reach orbit with the Kerban. Then we will use the left over fuel to escape Kerban and begin on a intersect course with another planet. Once we are close to said planet we will get captured by it's gravity. After some amount of time in orbit we will deorbit and sent the satillite to the planet so that we can get gravity, temperature and pressure readings. A paracute will be use to make sure the equipement will remain intact. Which planet are you headed toward? How will you create an intersecting orbit? Will you need to worry about the atmosphere on the planet as you land your vehicle? As this is an unmanned flight, from a safety perspective I'm sure you'll be in good shape, but from an efficiency standpoint, with a bit of planning you may save yourselves a bit of money, time, and frustration. (Hint - a Delta-Vee chart would be mighty useful here.) Check out The Drawing Board for a bunch of information that could help! I like the plan! Good idea using the nuclear engine for its efficiency. I give you guys the thumbs up for this launch. 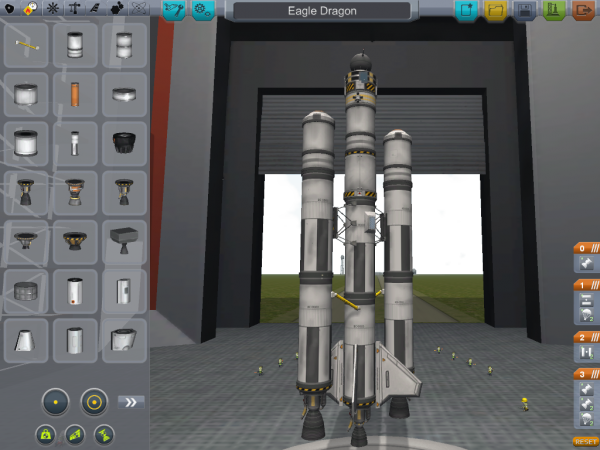 Play-by-Play: After a perfect launc, the Eagle Dragon achieved orbit with enough fuel in the main lift off tank to get it out of Kerbin's influence. After Burn and escaping into and orbit that intersects Eve's orbit suddenly we realize that there is no encounter but it's too late. Stuck in an orbit around Kerbol scientist are forced to leave Eagle Dragon for almost 1500 day(almost 5 earth years) Finally Eagle Dragon's orbit comes close enough and the control team on Kerbin makes a burn that sends it on an intersect course with Eve. Once under Eve's influence another burn was made that keeps Eagle Dragon in orbit around Eve. After servel orbits around the planet Eagle Dragon was set on a collision course with the planet to study it's surface. Once in the Atmosphere the parachute was deployed and Eagle Dragon landed safely on the surface of Eve. Summary: This taught use how to get transfer to another planet's orbit which will be necessary to get Kerbmans on other planets and back. Opportunities / Learnings: We learned that we can just launch a ship into space and hope it will intersect a planet because we can have to wait a very long time which won't be good for the Kerman's on the ship. Strategies / Project Timeline: Next we might launch a space station into orbit so that we can use it to store fuel for future expeditions. Milestone Awards Presented: First to Orbit another planet. Hmm, You should make the nuclear engine decouple-able and have the probe use two parachutes. It then can land with a higher chance of not blowing up. I suggest not doing a manned mission due to the size of the lander and returner. I suggest duna for another target. Requires more delta-V but is a nice place. If you do a manned mission there in the future maybe it could land by parachutes or glide like a plane. Use areo spikes for the plane idea afor theirs no oxygen. Always do unmanned missions first for two reasons. 1. Check if your idea works. 2. Save a possible life in case it fails. 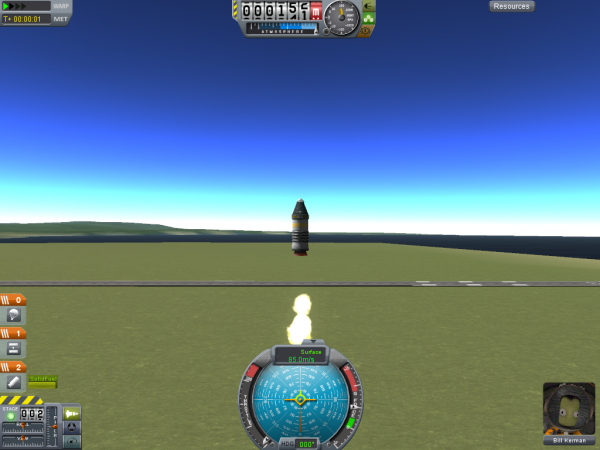 Also remember it takes more fuel to land or take off with a actual capsule because they weigh a lot more. But nice job getting into orbit! Once I was getting a probe into orbit but it was failing, So i improvised and was able to intersect the mun's orbit and now it's a mun orbiter. Remember, If something doesn't go to plan try to improvise. Especially with manned capsules. If it cannot return and is manned, Send a rescue probe or crew with fuel or a habitat module. Congrats on your great exploration!